Editor’s note: Francesc Ortega and Suleyman Taspinar are economics professors at Queens College, City University of New York. This analysis is being published here in collaboration with EconoFact, a nonpartisan economic publication. The chance of large-scale coastal flooding episodes is increasing. In the last few decades, sea levels have been rising steadily at about 3 centimeters per decade and many estimates expect that this rate will accelerate going forward. At the same time, the population living in coastal counties in the United States grew by 40 percent between 1970 and 2010 and is projected to continue rising. Are people considering the increased risk of flooding associated with sea level rise in their housing decisions? Looking at what happened to property values in New York City after Hurricane Sandy gives us a first look at how those on the front lines may be responding. Past research has found the response of homebuyers towards flooding risks and the threat of other climate-related hazards to be short-lived. While a region’s exposure to hurricanes or flooding does not vary greatly from one year to the next, many studies have found that homebuyers tend to take these risks much more into account immediately following hurricanes and other catastrophic events. However, these effects tend to be short-lived — very often vanishing completely within five years (see here and here). Flood insurance take-up rates, for instance, have tended to spike the year after a flooding event and then gradually decline to the levels that prevailed before the flood. This response happened not only in the flooded zones but – to a lesser extent — also in non-flooded areas in the same television media markets according to one study. While the risk of flooding remains objectively the same, people may be more aware of it following a flood and then tend to forget about it with the passage of time. It is also possible that, as time goes by, new people who have had less direct exposure to the risk move into the area. These facts suggest a gap between objective probabilities of flood risk and households’ perceptions of this risk. In addition to the psychological biases mentioned, coordination problems, misguided policies, and the expectation of financial assistance by the government in case of disaster might contribute to a mismatch between home prices and damage risk. Hurricane Sandy was a climatic event of unprecedented proportions that impacted the Greater New York region. The storm hit New York on October 29, 2012. At the time, Sandy was the largest Atlantic hurricane on record and the second costliest in U.S. history (behind Hurricane Katrina), with damages amounting to over $19 billion. Hurricane Sandy flooded 17 percent of New York City (or nearly 90,000 buildings). At the time, Sandy was the largest Atlantic hurricane on record and the second costliest in U.S. history. Did Hurricane Sandy change New Yorkers’ perception of flooding risks? In our research, we analyzed the effects of Hurricane Sandy on housing prices in New York City. We assembled a large parcel-level dataset containing all sales during the period 2003-2017 along with FEMA data on which building structures were damaged by hurricane Sandy, and to what degree. Our data shows that, prior to Sandy, housing values were essentially the same for properties located on the flood zone and properties elsewhere in the city, once neighborhood and property characteristics are accounted for. In contrast, we find robust evidence of a negative impact of Sandy on the price trajectories of houses in New York’s flood zone starting in the quarter immediately after hurricane Sandy (see map and chart). We estimate a persistent price discount of about 8 percent that, 5 years after the hurricane, shows no signs of vanishing. Within the flood-zone, the price trend for properties differed depending on whether they were damaged during the storm. Properties damaged by Sandy experienced a large immediate drop in price (of more than 15 percent), followed by a partial recovery that probably reflects their gradual restoration as owners invested in their repair (see here). In contrast, properties within the flood-zone that were not damaged by Sandy saw a gradual decline in their value. By 2017, the price discount on these flood-zone properties appears to converge to the same discount as properties that had suffered damage during the storm. Other emerging research is finding signs that home buyers in some coastal markets are beginning to take into account increasing flood risks. 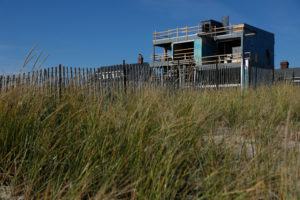 Our findings for New York are in line with the findings of a recent study using national data, which estimates a 7 percent price discount for properties exposed to rising sea levels and argues that the effect is driven by sophisticated buyers and communities concerned about climate change. Similarly, a new study of Miami-Dade County, Florida, finds that prices for properties that are closer to sea level — and hence more subject to flooding risks — are appreciating more slowly than properties at higher elevations (see here). A timely revision of beliefs about the risks entailed by climate change is important to remain optimistic about the adoption of policies and innovations to help coastal cities adjust. Our findings suggest that, in some cases, catastrophic events — and the economic disruption they bring forth — may be needed to create awareness regarding the changing risks associated with climate change. Five years after Hurricane Sandy, housing prices in New York City’s flood zone have seen an 8 percent reduction when compared to similar properties with lower flooding risks. Unlike findings from other floods, where prices drop sharply following the event but only for a short period of time, the price decline in the flooding-zone following Sandy shows no sign of fading for now. Francesc Ortega is a professor of economics at Queens College, CUNY. Suleyman Taspinar is a professor of economics at Queens College.